When most people think of learning, they think of acquiring knowledge or a specific skill, such as facts about history, new vocabulary words, or how to play an instrument. Learning also encompasses behavior in a much broader sense than the aforementioned specifics. To mental health professionals, learning, on a most basic level, involves behavior modification. For example, when students learn how to do long math problems, they are using a process that a teacher showed them, but they are actually learning a behavior (how to solve long math problems). As a result, when presented with a math problem in the future, people draw on that behavior (or learned method) to solve the problem. Of course, not everything that people do is learned through teaching or firsthand experience. Rather, there do exist some behaviors that are purely instinctual, or behaviors that people (and animals, too) are genetically programmed to exhibit in certain situations. An example of this is the fight- or-flight impulse. In a scary situation, the human body produces the steroid adrenaline, which makes the heart pump faster and the lungs work harder. This is an unconscious response that readies a person to "fight" if the situation calls for it or to "flee"; again, this is not a learned response to fear or danger but an instinctual one. These behaviors are also referred to as being innate responses (or inborn). Alzheimer's disease is an illness that causes people to forget things, even the people in their lives. They cannot remember recent experiences they have had or how to perform tasks that previously required little or no thought at all. Alzheimer's usually afflicts people in their late sixties, seventies, and beyond; however, the disease has been diagnosed in people as young as thirty. The disease often progresses until a person has difficulty speaking or functioning on his or her own. Eventually, the body's basic functions, such as breathing and digesting, break down until the person enters a coma and dies. Sometimes the disease progresses quickly, and death results in as little as five or six years. Other times, a person suffers with the disease for as long as twenty years. Alzheimer's is a devastating disease not only to the person afflicted but also to the family and friends who must witness their loved one's suffering. There are many organizations devoted to supporting families and friends who are dealing with the disease. In addition, scientists are working hard to discover new ways of coping with the disease and to develop new treatment. 1. Memory loss that affects job skills. It is normal to occasionally forget an assignment, deadline or colleague's name, but frequent forgetfulness or unexplainable confusion at home or in the workplace may signal that something is wrong. 2. Difficulty performing familiar tasks. Busy people get distracted from time to time. For example, you might leave something on the stove too long or not remember to serve part of a meal. People with Alzheimer's might prepare a meal and not only forget to serve it, but also forget they made it. 3. Problems with language. Everyone has trouble finding the right word sometimes, but a person with Alzheimer's disease may forget simple words or substitute inappropriate words, making his or her sentences difficult to understand. 4. Disorientation to time and place. It is normal to momentarily forget the day of the week or what you need from the store. But people with Alzheimer's disease can become lost on their own street, not knowing where they are, how they got there or how to get back home. 5. Poor or decreased judgment. Choosing not to bring a sweater or coat along on a chilly night is a common mistake. A person with Alzheimer's, however, may dress inappropriately in more noticeable ways, wearing a bathrobe to the store or several blouses on a hot day. 6. Problems with abstract thinking. Balancing a checkbook can be challenging for many people, but for someone with Alzheimer's, recognizing numbers or performing basic calculations may be impossible. 7. Misplacing things. Everyone temporarily misplaces a wallet or keys from time to time. A person with Alzheimer's disease may put these and other items in inappropriate places—such as an iron in the freezer, or a wristwatch in the sugar bowl—then not recall how they got there. 8. Changes in mood or behavior. Everyone experiences a broad range of emotions—it is part of being human. People with Alzheimer's tend to exhibit more rapid mood swings for no apparent reason. 9. Changes in personality. People's personalities may change somewhat as they age. But a person with Alzheimer's can change dramatically, either suddenly or over a period of time. Someone who is generally easygoing may become angry, suspicious or fearful. 10. Loss of initiative. It is normal to tire of housework, business activities, or social obligations, but most people retain or eventually regain their interest. The person with Alzheimer's disease may remain disinterested and uninvolved in many or all of his usual pursuits. Reprinted with permission of the Alzheimer's Association of America. When babies are born, their brains are made up of billions of neurons (nerve cells that carry messages to and from the brain to other parts of the body). Over time connections, called synapses, form among the neurons that are vital to proper brain functioning; these synapses help individuals make mental connections between different areas of the brain and between different information so that they may learn and develop to their fullest mental abilities. What drives the establishment of these synapses is stimulation, particularly during infancy and early childhood. Stimulation can be anything from color, to light, sound, or touch; anything that captures the child's attention and makes him or her think. When stimulation occurs, synapses are built and strengthened. Without stimulation or even reinforced stimulation, key synapses either will not form at all or will wither away. While things such as intelligence and creativity may be partially determined by heredity, these connections are what determine maximum development. 1. A nurturing, secure environment that provides emotional caring and safety. 2. A sense of predictability so that a child develops a sense of emotional stability. 3. Conversation and communication; the spoken word boosts brain-power. 4. Encouragement and praise with regard to a child's accomplishments, however minor, to provide a sense of empowerment. 5. Helping children make cognitive connections by pointing them out (point out the car in the picture and then take the child for a ride in the car). 6. Knowing when a child has had enough stimulation and needs some quiet time. Mental disorders such as attention-deficit disorder and learning disabilities can hinder learning, as discussed in Chapter 12 on Mental Illness. However, certain environmental factors and conditions can also hurt a child's ability to learn. A neglectful home environment in which stimulation is absent can spell the beginning of future learning problems for any child. Particularly stressful events, such as the death of a parent, or a stressful situation, such as homelessness, can also have adverse affects on a child's ability to concentrate on and respond to mental stimulation. Several kinds of learning that are present throughout the life span influence the acquisition of knowledge and the alteration of behavior. Proposed by prominent doctors, scientists, and therapists throughout the years, their principles remain unchanged and are the foundation for many forms of therapies (for more information see Chapter 15: Mental Health Therapies). CLASSICAL CONDITIONING. Formulated by Russian physiologist Ivan Pavlov (1849–1936), classical conditioning involves an automatic response to a certain stimulus that is acquired and reinforced through association. Pavlov illustrated the principles of classical conditioning after training dogs to salivate (involuntarily) upon hearing the ringing of a bell. Pavlov accomplished this task by first ringing a bell just before he fed the dogs. After a while, the dogs began to associate the ringing of the bell with getting their dinner. However, the response was ingrained in the dogs on such a deep level that the food was no longer the stimulus for salivation; rather, the ringing of the bell alone made the dogs salivate. This can be seen in people's everyday behavior in different situations. An infant will learn to respond to the sound and smell of its mother before being given a bottle; the child is responding not to the bottle, but to the voice or scent of the mother. Similarly, if every time a child's parent calls him by his full name ("Come here, John Michael Smith! "), he gets yelled at, his heart may beat fast just hearing his full name being called, before his parent has even scolded him. Light and different types of light can influence and affect how one learns. In the 1940s and 1950s, biologist John Ott discovered that cool fluorescent lights (which are used in many classrooms) can make some children overly excited, thus making it difficult for them to learn, especially those students with attention-deficit disorder (see Chapter 12: Mental Illness). Natural light, or light that closely mimics natural light, is best for studying and learning. OPERANT CONDITIONING. Unlike classical conditioning (which involves involuntary response to a certain stimuli), operant conditioning involves voluntary response to a certain stimuli based on positive or negative consequences that result from the response. First put forth by psychologist B.F. Skinner (1904–1990), an example of operant conditioning is training a dog by using treats or verbal praise to reinforce the desired result. If an owner trains her dog Fido to give her a paw when the dog's shoulder is touched and the dog performs the task and is rewarded with a biscuit or kind words, the dog will associate successfully performing the task with the tasty treat or the praise. Similarly, if a dog is consistently scolded when it chews something it should not, the dog will make the association between chewing a forbidden item with harsh words and will learn not to engage in that behavior anymore. The same principles apply to human behavior. If a child learns that she is rewarded by successfully completing her homework each night, doing her homework will become important to her. Positive reinforcement of a behavior will usually cause a certain behavior to continue, while punishment or the absence of reinforcement will result in a behavior being extinguished. Behavior modification, a way of promoting positive behavior and eliminating negative behavior, is built around principles of operant conditioning. There has been much attention given to the notion of brain dominance in recent years. A popular book on learning to draw is entitled Drawing on the Right Side of the Brain: A Course in Enhancing Creativity and Artistic Confidence. This refers to the split-brain theory put forth by scientists who believe that the left side and the right side of the brain represent different types of thinking and that each person leans toward one or the other. The left side of the brain is geared toward verbal skills, analytical ability; the left side of the brain also emphasizes aggressiveness and rigidity, and organization. It has been found that left-brained individuals are typically drawn to pursuing careers as accountants, attorneys, or careers in the military. In contrast, the right side of the brain is more geared to artistry, playfulness, intuitiveness, and fluidity; passivity and emotional flexibility are signs of right-brain thinking. It has been found that right-brain people are more likely to become artists, entrepreneurs, and educators. The theory of brain dominance, when applied to the arena of learning and education, means that instructors and parents, when possible, need to take into consideration whether a child is left-side or right-side oriented and tailor teaching methods to that dominance. OBSERVATIONAL LEARNING. Another way that people learn is through watching others or observing. A teacher trying to teach students how to add several numbers together will often explain the principles behind the method and will then demonstrate the method by solving a sample problem. The students then learn by observing the teacher. This is true of sports as well (watching a team execute certain plays during a sporting event) or behavior (watching someone get a desired result by giving a certain response). For example, a person might learn how to disarm her parents when they are angry with her by observing and adopting her brother's response, which seems to effectively calm their parents. Observational learning is important in social learning. 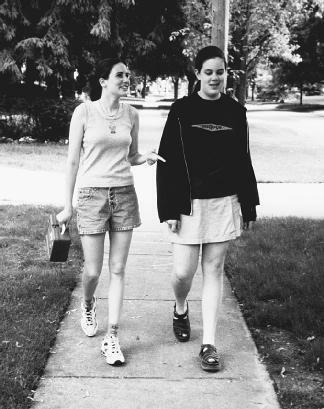 Young adults are likely to observe the habits and behaviors of their peers and adopt them as their own if they see those individuals gaining social acceptance through those habits and behaviors. This can include innocent things, such as ways of dressing or studying, or more harmful things, such as choosing to smoke, because those who do have gained a result that is desirable to those observing them. Modeling (basing one's behavior on that of another person with whom there is a strong identification or desire to be like) is a part of observational learning, and young adults can model their friends' behavior as outlined in the previous paragraph. Modeling can also take place between people and someone they admire but do not personally know, such as a celebrity. For instance, if a young adult is a big fan of Madonna and hears that she does yoga every day, that young adult might be likely to take up yoga. The same holds true even if the person upon whom the teens are modeling themselves engages in harmful behavior. A celebrity who is caught engaging in risky behavior may influence young adults (and older adults) to engage in similar behaviors. Celebrities and public figures are often called "role models," even when they do not wish to be. They are generally held to higher standards than other people because their behavior is more likely to influence a large number of people.